The Fire made a pair of announcements Thursday, including the signing of reigning MVP Mike Magee to a new contract and the loaning of Giuseppe Gentile to the Charlotte Eagles of the USL Professional Division. It was reported during the preseason that Magee’s absence from camp was due to holding out for a new contract. While the club denied the rumors, Magee’s new contract is thought to include a sizable increase in salary. The Major League Soccer Players Union released salary figures for all players in the league Thursday, updated as of April 1. The figures peg Magee as the team’s highest-paid player with a base salary of $350,000 and a guaranteed compensation of $417,500. Updated figures will be made available at a later date. Magee’s limited preseason action led to a delay in his 2014 regular season debut; however, Magee had a strong performance Saturday against Philadelphia that included his first goal of the year. The Fire were one of just eight MLS teams to enter the season without a minor league affiliate in the USL Professional Division, but the strength of the partnership between MLS and USL Pro was on display when the Fire loaned Gentile to the Charlotte Eagles. Charlotte is one of just three USL Pro teams to not have an affiliate in MLS. Gentile has not seen first-team action with the Fire yet, but has played in three reserve team matches this season, including a two-goal performance against New York March 24. 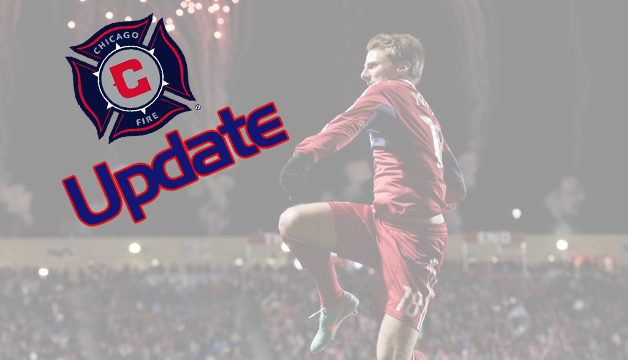 The Fire announced that the team has the option to recall Gentile at any point throughout the season. Head Coach and Director of Soccer Frank Yallop said in the press release that Gentile could participate in U.S. Open Cup and Reserve League matches with the Fire this season. Related Salary Notes: Twelve players in the league have guaranteed compensations over $1 million: Seattle’s Clint Dempsey ($6.695 million), Toronto’s Michael Bradley ($6.5 million), Toronto’s Jermain Defoe ($6.18 million), LA’s Landon Donovan ($4.58 million), LA’s Robbie Keane ($4.5 million), New York’s Thierry Henry ($4.35 million), New York’s Tim Cahill ($3.625 million), Montreal’s Marco Di Vaio ($2.6 million), Seattle’s Obafemi Martins ($1.753 million), Vancouver’s Pedro Morales ($1.41 million), LA’s Omar Gonzalez ($1.25 million) and Toronto’s Gilberto ($1.2 million). As of the time of the player survey, Magee’s salary was the third-lowest of any team-high figure. Houston’s Brad Davis had a base salary of $345,000 and Colorado’s Edson Buddle checked in at $325,000. Toronto FC leads the league with a guaranteed team compensation of $16.65 million, while Chivas USA checks in at $3.29 million. Below is a graphic of each team’s salary cap and actual payrolls.